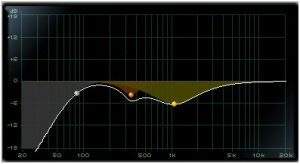 We all know that your listening environment has a big impact on the quality of your mix descisions. Perhaps you’ve already hung some acoustic panels, (maybe you’ve installed a bass trap or two) but how do you know how effective they are? Well, there are many ways to measure your rooms response but I found some helpful audio test files that will give you a pretty good rough idea as to what’s happening in your room. Check ’em out! Grab A Free Copy Of Our Mixing Course! Grab a free copy of the “3 Simple Steps To Amazing Home Recordings” video course and start making amazing recordings today! Unless you’re outdoors, or listening on headphones, you’ll notice the volume rising and falling as the audio plays. That’s normal, although the level doesn’t actually change. (Open the MP3 in your DAW to confirm this.) Rather, you’re exposing the acoustic response of your room. Additionally, the sweep can expose low-frequency dependent rattles, buzzes, or other sympathetic vibrations happening in the area around you. With this test, I once discovered the casing on an overhead light shook at exactly 140Hz, after puzzling with a mix for 15 minutes, unable to isolate the odd rattling sound. Use this to test for: Bass response, specific problem notes. Here, the tone ascends through a chromatic scale. Certain notes will jump out or disappear, for the same reasons as above. Remember these notes, as they’re important to the character of your mixing space. Specifically, when you know that, for example, the B at 61Hz drops in volume in your space, you can reconsider when you find yourself reaching for the fader every time the bass guitar plays B. Contents: 5 bursts of white noise at different pan positions. Use this to test for: Coarse panning issues. This file plays sound at the center, hard left, hard right, half left, and half right. If you don’t hear 5 separate panning locations, you’ve got stereo issues! Most stereo imaging problems are caused by incorrect speaker configuration (i.e. the speaker aren’t equal distances from your ears,) and poor room acoustics. Contents: White noise at 3 different pan positions. Use this to test for: Fine panning issues. This file plays a sound at 50% left, then hard right, then 25% left. (The jump to the right distracts your ear so it can’t track the sound moving from 50% to 25%) The 3 sounds then repeat on the other side. On the other hand, if the difference from 50% to 25% isn’t clear in your monitors, or is more defined on one side, you might want to consider using headphones to verify your important panning decisions. I’m sorry but I’m new at this and I just wanted to check what I’m listening for. Lets say I’m checking the low end, what am I checking exactly? If it gets louder at one Hz what does that mean? These audio sweeps are just designed to expose where your rooms peaks and nulls are. You can treat these using EQ but it’s better to use absorption and bass traps to fix the room instead. Thanks! It doesn’t let me download them so I can put them in my DAW. I was wanting to do that so I can actually see what frequencies are being sweeped. Woops nevermind. I can do that easily in Logic with the test oscillator. Not 1 Hz but a certain frequency I mean. We obviously can’t hear 1 Hz. its just good to hawe a little dipp in the eq betwen 100Hz – 200Hz… all 99% of all rooms in the wold has a little mud upp there! ewen my Car alsows hawe mud in about 100Hz – 200Hz. maby the Super studios has som spesial traps to treat 40/60100-200Hz away. lol Just eq it away (max5db) and ad it back again before bounsing. problem solwed!